Richard Mayer has over 500 publications to his name and does something extraordinary. He tells us how to design online learning. What makes his work so brilliant, and useful, is that some of his findings are counterintuitive. Take this brilliant example. When showing a series of graphics, photographs, animations or on video, should you show procedures from the first (learner) or third (teacher’s) perspective? You should show from the first person perspective to achieve higher retention and transfer. This is not surprising, when you think about what you are trying to achieve – cognitive change in the learner’s brain. First person is exactly how the actions will be performed in real life, so that viewpoint is more congruent with the eventual outcome. Yet most photographers, animators, graphic artists and video Directors’ are likely to create or shoot a third person perspective. There is the additional advantage of a more open, less occluded view, as the hands and fingers are not covering the action. It may be trickier to shoot, as the instructor lies between the camera and the action, but it is right. 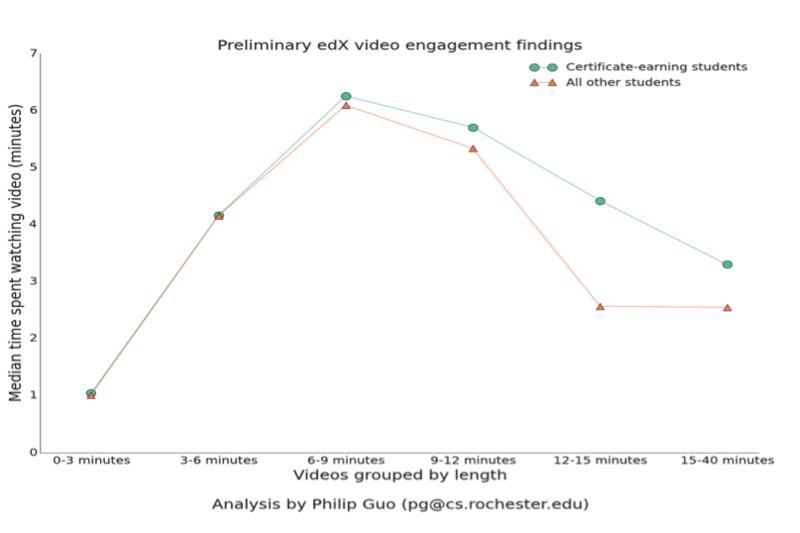 Philip Guo has tracked median engagement times versus video length, aggregated over several million EdX maths and science video sessions. He found that the average engagement time of any video maxes out markedly at 6 minutes, regardless of its length. An interesting side finding was that students who had enrolled for the certificate engaged more with the videos. Lesson: keep videos below 6 minutes. The edX researchers, confirmed by the MOOC factory in Lausanne, have found that, in addition to avoiding the dreaded 1 hour lectures, one should also avoid simply chopping up the existing 1 hour lecture into 6 minute chunks. Take time to rework and rehearse the chunks as small videos in themselves, not the result of meat-chopper editing. In an HCI MOOC I took, from Stanford no less, the talking head was postage stamp size in the bottom right of the screen. Nass and Reeves showed that screen size does matter when it comes to learning. As my BBC film editor used to say – it’s all in the eyes - you need to see the eyes of the presenter or lecturer. In fact, Nass and Reeves showed that size actually increases retention, so make your video as large as possible on screen or allow full screen viewing. Although poor quality video quality is rarely the problem when it comes to learning and retention, bad audio can cripple both. Poor quality images are not necessarily damaging in terms of learning and retention, poor quality audio, however, is bad news. Nass and Reeves showed that poor audio (hissy, distant or robotic) can seriously affect retention. That's because our auditory systems have evolved to deal with dialogue as hi fi - close to our ear. Video and accompanying text is a no-no. Never put the script up at the same time as the video. It overloads working memory and damages learning. Mayer (2001) suggests that both a visual and a narrative description increases the amount of time information about the process can be held and processed in working memory, leading to measurably lower retention. In research on 862 videos from four edX courses, for subjects that rely on symbolic, semantic reasoning, such as maths, physics and coding, worked examples (a la Khan Academy or Udacity) work far better. Less theory, more examples. With talking heads, go full screen and alternate with slides. Use talking heads for conceptual explanation and slides for diagrams, images and pictures that really do explain a point and don’t merely illustrate the point. This is important, stock shots and images that done;t add to the learning are to be avoided. In trials in nursing training we found that video was good for attitudes, procedures, processes and showing things that require motion but not so good for semantic knowledge, especially detail on numbers, such as doses, number of days, names of drugs, pathogens and so on. This 'semantic' knowledge required supplementary methods for learning. To this end we grabbed the transcripts from the video, used AI (WildFire) to create online learning in minutes, not months, and focussed on the semantic detail. This gave us the best of both worlds - video based plus text based learning. We then went on to show video followed by completely open input, where the learner has to recall what they think thy've learnt from the video (or segment), with AI semantic analysis of their answers. This is immensely powerful in terms of retention and recall. I have followed your postings on MOOCs for some time - I thought you would be interested in this, if you haven't already seen it. A gritty and grounded review of best practice.